Yesterday the sky attracted my attention. In the morning I saw thin lines of rain hanging from the clouds without touching the ground. 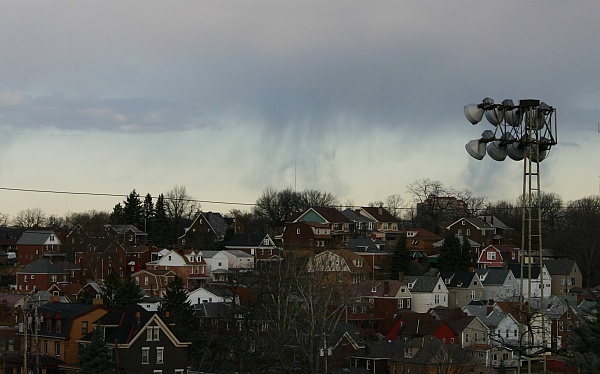 Virga means “rod” in Latin and is the name for precipitation that evaporates before reaching the ground. It’s very common out West where the air is dry and virga’s rapid evaporation causes high winds. I tried to take a picture but the best of the virga drifted behind the ballpark lights. In the middle of the photograph you can see “rods” falling and curling from the cloud. Moments earlier there was more separation between the rain and the ground. I just wasn’t quick enough. Click here for a much better picture of virga. The sky cleared at midday, then high, thin clouds moved in ahead of a cold front. Way up there, above 20,000 feet, the air was filled with tiny ice crystals that caused an optical effect — a halo around the sun. 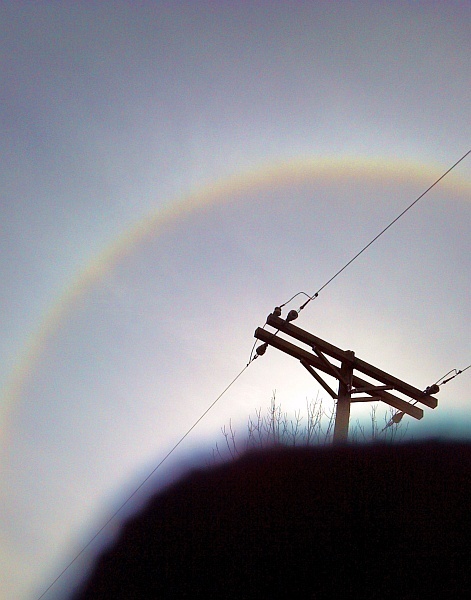 Halos are circular pastel rainbows that occur when sunlight passes in one side of the hexagonal ice crystals and out another side. The light is doing this all over the sky but we typically see halos at 22o from the sun (or moon), though other angles are possible. I can tell you it’s hard to take a halo’s picture because the sun confuses the camera. I tried to block the sun with a telephone pole but that wasn’t enough. I had to use my mitten too, so this photo is odd. Click here for a better picture of a halo. Keep looking up. You may see some atmospheric effects. p.s. 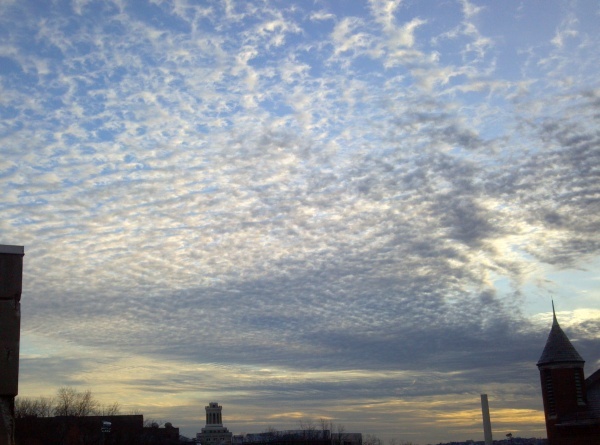 Late on Monday afternoon we had a mackerel sky (shown below). Can you guess why it’s called that? I was watching for sundogs all day and didn’t see any, but have seen the halo and pillars around the sun and a rainbow arched up like a smile at the same time…doesn’t happen too often like that…thunder and lightning last night in the snow after dark….the clouds yesterday changed all day…I am always looking up to the sky…you never know what you might see. I’m going to look at the sky more often. I don’t remember having seen a virga before, or even to look out for one! The mitten worked! Great picture. Thanks for discussing virga. My sister and I saw a good bit of it on a trip out west, and we were fascinated by it. Very dramatic out there with the wide open landscape.